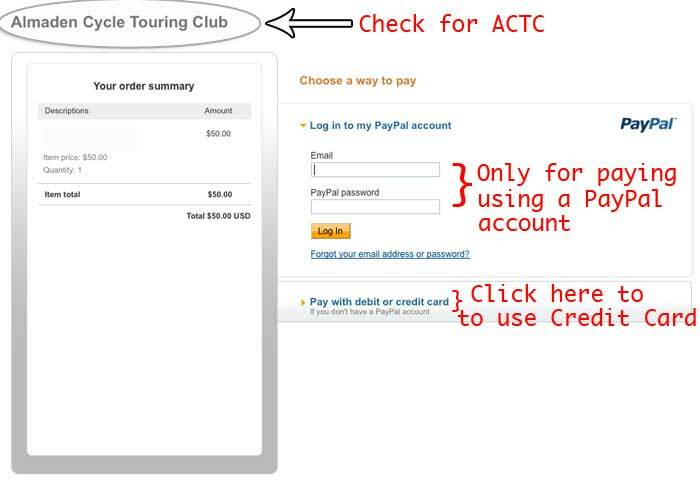 For many of the ACTC items we accept payment via PayPal. We use them because of their lower transaction rates and because they offer a secured system for handling financial payments. You Do Not need to have a PayPal account to make payment but can instead use a credit card. It can be a bit confusing because PayPal tries to get you to use their PayPal system so you have to look for the link to use a credit card. If you are paying by a credit card you Do Not enter any user name or password. The first screen you will see is shown below. First decide if you have a PayPal account and wish to use it, or if you wish to use your own credit card. If you wish to use a credit card, look for the link to click to take you to the credit card screen. From there you fill in your personal information and credit card information. Note that if are using a credit card to make payment and enter your email address to matches your PayPal account, they system will once again ask you to log in, trying to get you to use PayPal again. Do not log in, but look for the link to continue with the credit card. Make sure you complete through all steps, including receiving an email back with payment confirmation. Otherwise you have not made your payment.